Registration will open on 7/3/18 and close on 7/29/18. Registration age groups are the same as they were this spring and summer. It is encouraged they play at that level, although that is completely up to you and can be based on your girl’s ability. So if she needs more development in the age group she participated this spring, feel free to register her with a same age group. If your daughter is maxed out and you want to move her up one age group, then feel free. More information can be found at this website: sycwarriors.wixsite.com/sycwarriors-softball. The $85 fee includes 6 double headers to be played on weekends, a T-shirt provided for the uniform. Practices will start approximately mid-August. Games will start around 9/8/18 and are expected to end no later than 10/31/18. No fee to register for tournament tryouts but must register at sycwarriors.wixsite.com/sycwarriors-softball/join-us”. You must register at this link by 7/30/18. The Tryouts will be Saturday 8/4/18 (Rain Date of 8/5/18) and 8/11/18 (Rain Date of 8/12/18). Times for each age group will be provided by 7/7/18. Any questions email Mike Staub at [email protected]. 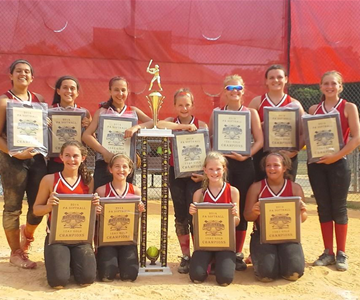 Fall Girls Softball Registration age groups are the same as they were this spring and summer. It is encouraged they play at that level, although that is completely up to you and can be based on your girl’s ability. So if she needs more development in the age group she participated this spring, feel free to register her with a same age group. If your daughter is maxed out and you want to move her up one age group, then feel free. No fee to register but must register on website. The Tryouts will be Saturday 8/4/18 (Rain Date of 8/5/18) and 8/11/18 (Rain Date of 8/12/18). Times for each age group will be provided by 7/7/18.